Were I a drinking man, I'd raise a tall glass of something hard to the single parent. I am not done with all I have to do, yet I am tired and ready for bed. A constant chorus sounds outside my bedroom door, each of my kids singing a different song as they finish their homework. While I thrill at the vocal talents of my three children, my ears are beginning to fill with wax, a physical response to my need for quiet. There is a broken dishwasher in need of replacement, and the dirty dishes are piled high (despite the sign that reads "Use Paper Plates!" hanging on the cupboard door). I am thinking about installing a fare meter in my car, which I am also thinking about painting taxi-cab yellow. I have 40+ emails from clients desperate for my attention. One half of my bed is empty, and as I look across my pillow at night I see nothing but the hollow darkness that hovers above Elizabeth's. I am tired, stressed, and lonely. It has been a long few days, and Elizabeth is gone for another two. My waking dreams are all about freezing time. I need the world to stop so that I can get things done without the pressure of backlogged requests. Exhausted, I collapse into bed to watch Ewan McGregor and Charley Boorman ride their BMW motorcycles around the world. 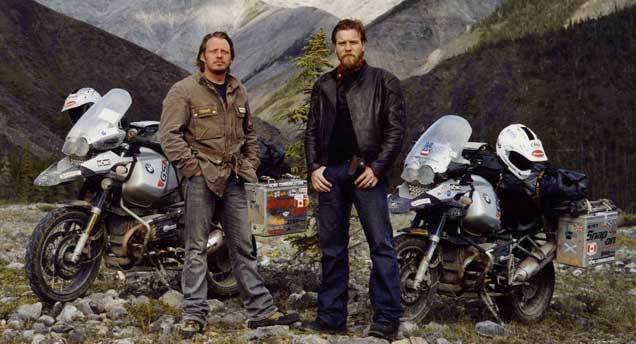 Elizabeth and I had been watching "Long Way Round" (for the third time) before she left, and my favorite episode is next in line; Siberia and the Road of Bones. The road, if it can be called that, which connects Vladivostok to Magadan, was not only built by Stalin's prisoners, but from them as well. Those that died along the way were buried as part of the road itself, giving the route it's the grim nickname. The episode both fascinates and depresses me. Their struggle to travel a road born of such tragedy and suffering makes for emotional television. I watch the episode in short bursts, pausing several times to handle requests from the kids, and then to take a phone call from Elizabeth after they are in bed. By the time Ewan and Charley reach Magadan and climb the hill that leads to "The Mask of Sorrow," a monument erected in memory of those that died building the road, it is late into my night. The episode ends, and notwithstanding the hour I jump on the Internet and begin studying the terrible road, and the dark story of how it came to be. Many clicks later I find myself reading about another scar on Russia's history. The disaster at Chernobyl has fascinated me since I first heard of it over twenty years ago (it has been 25 years almost to the day since the reactor explosion in 1986). With every click, images of abandoned homes, businesses, and hospitals flash up on the screen. The floors are littered with everyday items; clothes, books, toys, furniture, even family photos. All of them were left behind in the desperate evacuation, which was ordered far too late to do most people any good. Gas masks are everywhere, and I wonder if people left them behind knowing that it was useless to don them. 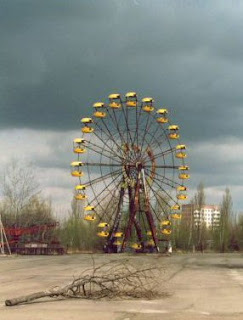 A Ferris wheel stands in the empty city of Prypiat, a rusting reminder of the children that were growing up there when the disaster struck. I've seen all of these photos before, and while they never fail to mesmerize and make me sad, they are just pictures of abandoned brick, mortar, and belongings coated with an invisible layer of poisonous atoms. While they invoke memories of things I never did, with people I have never met or seen, their impact stops short of anything emotional. They are merely fascinating to look at and wonder about. The final click of the night brings me to an online exhibit that I have never seen before. 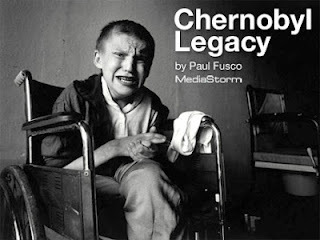 Photos taken by Paul Fusco begin to fade in and out from one to the next. As I watch, I imagine in Paul a man whose life was altered with each click of the camera lens during this particular shoot. 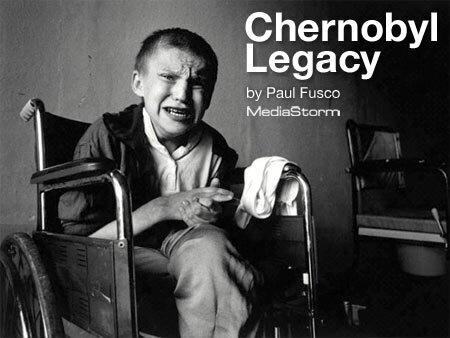 His photos are of children effected by the nuclear disaster. 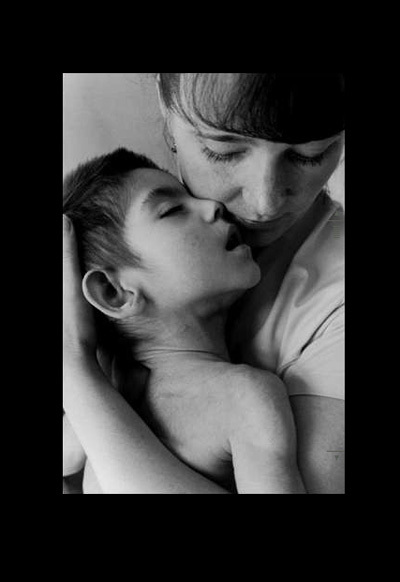 The images break my heart. My eyes fill with tears, and my hands reach up to hide my face, an involuntary response to the emotional wave that folds over me. The slide show ends, and I want nothing more in that moment than to fly east, find these children, and hug them. But I can't, and the prideful thought that a hug from me could make a difference in their lives fills me with self loathing. I sit on my bed surrounded by silence. 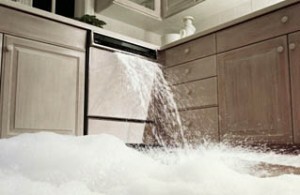 I think about my list of unfinished items, and the dishes piled high on the counter downstairs. The thought of my selfish whining earlier in the evening weighs me down with shame, pressing me deeper into my comfortable bed. Helpless and full of sorrow, I once again wish for the power to freeze time and stop the world, with a little time travel on the side. After several minutes I leave my bedroom and wander through my beautiful, radiation-free home. One by one I quietly open the door to each of my children's bedrooms and watch them sleep. 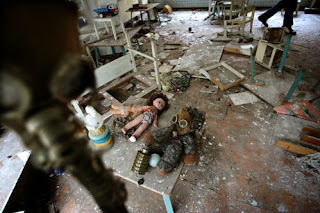 To watch a slide show that will break your heart but make you thankful for even your most difficult days and the most "trying" moments with your children, click here: Chernobyl.